Let us assume, for the sake of argument, that the Democratic Party has decided the debt ceiling is unconstitutional. What next? 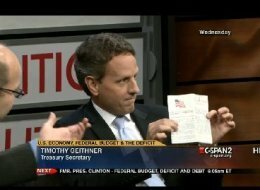 Well, Tim Geithner clearly believes it is, and that's him flashing the Fourteenth Amendment in his pocket constitution over to the right. It's probably the best picture you'll ever see on this blog. Other than Tim Geithner, nobody can agree. Ezra Klein says that a constitutional fight over the debt ceiling risks freaking out bond markets, which is the exact outcome we're trying to avoid. Jon Chait says, "Sure, but what if no deal is forthcoming? Since the bond markets are going to melt down anyway, Obama should at least try to get rid of the thing!" Yglesias adds that, even if a deal is struck, it's going to set a horrible precedent that leads, inexorably, to either default or a constitutional fight, at some point down the road. For my part, I think Matt has the upper hand here. Klein's entire argument is based on a faulty premise: that the bond markets will stay calm so long as this debt ceiling fight stays "normal," and that they might implode if it starts to look a bit odd or anomalous. Fair enough, but there's one problem -- it already is odd and anomalous. In the past, Congress might have huffed and puffed about the ceiling, but it certainly never had the gall to demand major substantive concessions in exchange for not destroying America's credit. Taking that into account, Klein's argument becomes, "This debt ceiling business actually is a mess, but the markets haven't noticed yet. Nobody... move... a... muscle." And that's not helpful, for the exact reason Matt says. Even if Obama does manage to work out a deal -- a horrible, no-good "compromise" that gives the Republican minority 95% of what they want -- and even if the markets stay fooled, well, guess what? We'll be back in this exact same boat the next time the debt hits the ceiling. So, within two years, probably. Congress will have learned that the minority has virtually unlimited leverage to demand concessions every couple of years, and there's no reason to think it won't leap at the chance to do so. And, as Matt says, the problem is severely exacerbated by the nightmare of institutional design that is the filibuster. If the minority party has 41 or more seats in the Senate -- something that describes every Congress in the last four decades -- then it has the ability to block the debt ceiling vote and demand concessions. Basically, we'd be creating a system where the majority governs 90% of the time, and the minority gets to hold the country at gunpoint and make demands the remainder of the time. And since the minority party would also have a large say in just how high the debt ceiling gets raised, what's to stop them from setting it so that they get to drag everyone back to the negotiating table nine months down the line? There's only one way this can end. The majority puts its foot down, and either there's a default -- accidentally or on purpose -- or someone finds a way around the ceiling, such as striking it down judicially or abolishing it legislatively. In the meantime, that gives the bond markets many years to realize just how thoroughly broken America's political system is, and adjust our interest rates accordingly. So I guess I'm of the opinion that we're better off dealing with this right now. Rip off the band-aid, so to speak. It might hurt a bit but in the long run we're better off for it. And if the ceiling can be thrown out completely, all the institutional risk attached to America's credit rating completely evaporates. Still, it's easy for me to say that. I'm just some guy with a blog. If I were a Democrat in Congress, or worse yet, President Obama, I'd feel pretty sick about the whole thing. I'd want to keep my options open and I'd sure not want to imply that I'm going to stand and fight on constitutional grounds -- at least, until I didn't have any other choice. After all, if the bond markets are irrational to think that there's no real risk of default right now, they're certainly irrational enough to spaz out because the debt ceiling was dragged into courts. All of which is why I think the constitutional issue, if nothing else, is a useful measure of the progress of the debt ceiling negotiations. The more we hear about the Fourteenth Amendment, particularly from the administration, the worse the negotiations must be going. One more thing: the constitutional option does seem to confer certain tactical benefits on the administration. As things stand, whatever happens, gets blamed on the president. Democrats are cornered into signing some sort of tremendously awful deal, entitlements get cut, and the economy struggles as a result? Obama's fault. We blow the deadline, there's no deal, the markets respond negatively, and Social Security paychecks stop going out? Also Obama's fault. But if the administration goes on the offensive against the debt ceiling, declaring it unconstitutional and continuing to borrow without congressional authorization, it puts the ball back in the GOP's court. Republicans would then have to go into court and argue that a certain segment of the US public debt is not valid. If we're past the Aug. 2 deadline by that point, they have to go into court and argue that the US should be in some form of default. Would anyone actually want to make that argument? Right now, the Republicans benefit from being able to pretend that their hand is forced. They say that American finances are so bad, they simply can't raise the ceiling without some sort of deficit deal. But if Obama ignores the debt ceiling and the country doesn't self-destruct, the GOP's nakedly extortionate ends will be exposed. They'll be in the uncomfortable position of asking for their hostage back, so that they can return to making ransom demands. Oh, and if any judge rules in their favor, the markets really might go into a tailspin. Fighting the administration would be politically (and morally!) precarious, and I'm not sure the Republican leadership has the stomach to carry that fight to its natural conclusion.